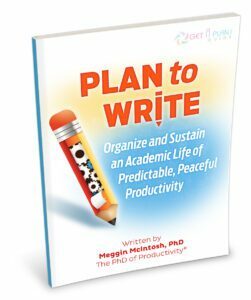 What if you could organize and sustain a joyful academic life of peaceful, predictable productivity? This life – of course – includes getting your writing done. You can have an academic life of joyful, peaceful, predictable productivity. You will not have a perfect life. But you will be more peaceful, more predictable, more productive, and more positive when you apply the ideas you will learn in this Get a Plan! Guide®. To purchase and download this 79-page full-color Get a Plan! Guide® – click the order button that says PDF. Once you check out through the secure shopping cart system, you will be redirected to a webpage where the PDF is ready for immediate download so you can begin reading and making notes.